Gibson Performance Exhaust Systems are the perfect solution for your vehicle if you're looking to add a little style, sound, and horsepower to your vehicle. Gibson Exhausts are true bolt-on systems that look and sound great. Because the factory mounting points are utilized, there is no welding or guess work. Simply unbolt your boring and inefficient factory exhaust system and your new Gibson Performance Exhaust bolts into place. All Gibson Exhaust Systems are dyno tested to assure increased horsepower and produce more torque before they are released to the public. All exhausts are mandrel bent to minimize exhaust restriction. Average horsepower and torque gains are 10-15 range on stock (unmodified) vehicles, and even higher numbers for vehicles running other aftermarket performance parts. 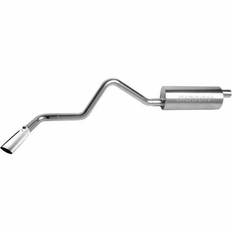 Gibson Exhaust Systems carry a limited lifetime warranty from the manufacturer. The part number for this item is 615597 and it fits 2003-2007 Chevy Trailblazer (4.2 RWD Only) models. 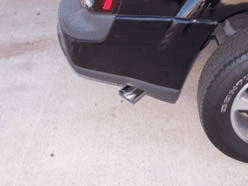 This exhaust features a 2.5" Diameter and a 3.5" Tip, exiting on the side of the vehicle behind the rear tire.. This is a Cat-Back exhaust, meaning all piping behind the cat is replaced.